Notes: Colored topographic elevations. Associated with book ID 3559. 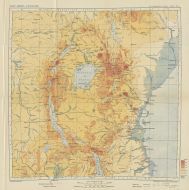 Published in The Geographical Journal of the Royal Geographic Society, Vol. 51. No. 3 in 1918.